There’s nothing bad I can say about this candle, nothing bad at all. It smells absolutely amazing – the sweetest, warmest honey – and 100% of the proceeds from the sale go to the RNIB to provide professional training for blind and partially-sighted people across the UK. 100% of the proceeds, people. No faffing around with “5% of profits” or “12p in every £10”, l’Occitane just go in with a nice, full-on, quibble-free one-hundred-percent. I like that a lot, it’s refreshing. I could easily launch into a rant about some of the humungous beauty giants who don’t donate all proceeds from their “charity products” (sometimes donating less than ten percent!) but I won’t. I might save that for another day. In the meantime: honey candles are IT! 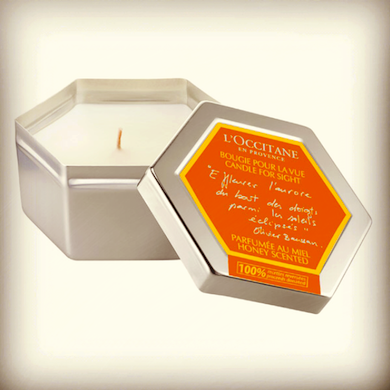 I love the simple, clean packaging of l’Occitane’s tinned candles and think that they make great gifts. And actually, if you’re looking for a way to fragrance your room but don’t want to pay through the nose for swish ceramic packaging with bows and bells on, these are a very good option. The limited edition honey one is a good pick if you’re looking for a scent to ease you gently into autumn – it still has hints of a lazy summer but it’s warming and cozy. I told you this candle could do no wrong! Previous Post Caudalie Vinexpert Range: Super-Boosted.